Playgroup meets every Wednesday from 10.00am-11.30am for parents/caregivers and children aged 0-5 years old (during school term). Playgroup is a time for children and their parents/caregivers to share play experiences and get to know others in the community. We have free play and some structured activities, story and song time, craft and snack time for the children and morning tea for the grown-ups. For more information, contact Jenny March via the Office. During the holiday periods there will be opportunities for the children and young people to be involved in the services, as well as activities in the church foyer and/or hall. Messy Church is a relaxed style of being church and a diverse worship experience for all ages that includes creativity, craft, hospitality and celebration. Messy Church is held on a Saturday twice a term from 5.00pm to 7.30pm and includes dinner. A creative time to explore a biblical theme through getting messy; a celebration time which might involve a story, prayer and songs; enjoying a light meal together. Day Camp is a children’s programme held in the January school holidays for Reception to Year 7. There are leadership opportunities from Year 8 onwards. Thanks to those who came to Day Camp 2019 (Cow-A-Bunga Farm). Registration information for Day Camp 2020 will be available here later in the year with registrations to open late October/early November. For more information, contact Sarah Carver via wpucdaycamp@hotmail.com. JAM (Jesus and Me) and Bourne Youth are combining JAM Camp and Winterbourne for an all new exciting camp called Momentum. There will be activities, small groups, community time, worship and more. JAM (Jesus and Me) is a social based activity program for young people in Years 6-9. JAM events happen every second Friday night of the school term, and run from 6.30-9.00pm. We have a range of different activities including Jailbreak, Cooking Night, Movies, Ice-skating, Ultimate Grip-ball, Play With Your Food Night, Skirmish and even more. JAM+ happens every Sunday morning from 9.15am-10.30am alongside KidsLife and our All Age Worship. We cook up some pancakes and catch up with friends, talking about our weeks and doing a small Bible session. For more information, visit the JAM website. 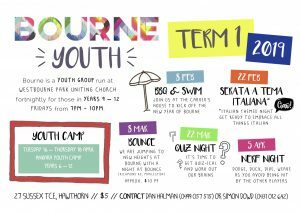 Bourne Youth is for young people in high school, years 9-12. It happens every second Friday night of the school term, and runs from 7.00-10.00 pm. We kick the night off with some general hanging out, and then get together for some awesome fun, pumping worship & to learn about God, issues facing us and how the two come together. Planned activities usually finish around 9.00pm and everyone is welcome to hang around until 10.00pm to chill out and chat with friends and leaders. Classes are held each Thursday during school terms from 9.30am to 12.00noon. We welcome people of all ages. You are invited to join an enthusiastic group who love their craft and enjoy conversation along the way. Each term there is an enrollment fee of $10.00 to secure your place in the class. Each week a class fee of $5.00 includes your morning tea. Plus the cost of any materials you may choose to purchase. This varies depending on your craft and project. For more information, send us an email or call the Church Office: 8271 7066. The Westbourne Park Uniting Church Netball Club started from and is still a big part of the community of Westbourne Park Uniting Church. The Netball Club has a dedicated committee and association structure with over 600 members, with many strong ties to our church and community. There are two competitions held each year; the Winter season which commences early April and concludes late August, and the Summer season which commences mid-October and concludes late March. Teams compete within the SA United Church Netball Association, which in turn, is affiliated with the Combined Australian Netball Association (CANA). For more information, visit the Netball Club’s website, or follow us on Facebook. Classes for the Community With the Community. Class instructor, Deb Harrison has been a qualified Physiotherapist, Fitness instructor and Pilates instructor for 30 years and has a passion for your well being. The “Road Hogs” meet most Saturday mornings for a group ride (and coffee) as well as occasional adventure trips. They’re a very friendly bunch and are always looking for new regulars and/or visitors. Small Groups are the best place to form deep relationships, meeting together regularly to talk about life, faith & culture. We currently have small groups running on multiple different nights of the week, over a large range of age groups. Small Groups are great at connecting with new people and asking questions in a relaxed and safe environment. Please ask around on Sunday, or just Contact Us about getting involved!